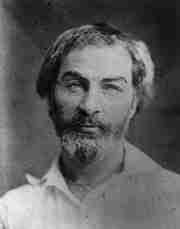 Comprehensive information about Walt Whitman including biographical information, facts, literary works, and more. American Walt Whitman, born on May 31, 1819, is considered to be one of the world's greatest and most influential poets and writers. This educational Walt Whitman resource has information about the author's life, works, quotations, articles and essays, and more. Articles about Walt Whitman or articles that mention Walt Whitman. Here are a few random quotes by Walt Whitman. Now I see the secret of the making of the best persons. It is to grow in the open air and to eat and sleep with the earth. The city sleeps and the country sleeps, the living sleep for their time, the dead sleep for their time, the old husband sleeps by his wife and the young husband sleeps by his wife; and these tend inward to me, and I tend outward to them, and such as it is to be of these more or less I am, and of these one and all I weave the song of myself.